The Middle Ages were a terrible time to get sick. There was no sanitation inside cities and hardly any in rural areas. While there might be some drainage or elementary sewers, the fact remains that people simply threw their bodily wastes out into the streets. Animal dung, dead dogs and rotting garbage of all kinds landed in the street and stayed there, trampled in and out of people’s houses. The Catholic Church controlled medical care, what there was of it. The Church determined that God sent sickness as punishment for sins, and prayer was the only recommended treatment. The main medical teaching of the time consisted of balancing the four humors for good health, which led to bloodletting and purging as the main treatments. While these treatments didn’t kill the patient (most of the time), they also didn’t do any good. Superstition and old wives’ tales were rife. Still, the doctors of the time did what they could to alleviate disease, the best using herbs and spices as treatments. While some diseases were treated with a degree of efficiency, others simply were beyond explanation and cure. What follows are a few of the most bizarre diseases of those times. In 945 A.D., hundreds of people in Paris became violently sick with nausea and great burning sores on their arms, legs and groin. Many fled to the church of St. Mary where Duke Hugh, Count of Paris, treated them. The people at St. Mary’s recovered and they returned home. As it turned out, the Parisians had eaten rye bread poisoned by an ergot infestation, although no one recognized this at the time. In fact, what we now know as ergot poisoning was thought to be witchcraft due to the many hallucinations experienced by the afflicted. Throughout the Middle Ages, ergot poisonings were common, often killing many thousands at a time. Ergot, a fungus which grows on rye and other grain during wet seasons, causes two sets of symptoms—convulsive, which causes contortions, twitching and hallucinations—and gangrenous, which causes nausea, burning sores, pain and loss of limbs, as well as hallucinations. When the people were at St. Mary’s, Duke Hugh had fed them from his own clean store of grains—which promptly relieved their symptoms. In 1093, the Order of St. Anthony was founded to treat people so afflicted. As St. Anthony was the patron saint, the condition was called St. Anthony’s Fire. One day, in 1518, a woman in Strasbourg began dancing in the street, which might not seem all that unusual, but she kept dancing, and people joined her – 34 within the week and 400 more after that. None of these people could stop dancing, though they were frightened and desperate. Town authorities and physicians thought that when the dancers got tired they would stop, so they built stages, hired musicians and set aside places for them to dance. To everyone’s shock, the affected people danced until they died of stroke, exhaustion, heart attack or dehydration. Strangely enough, dancing plagues were not uncommon. 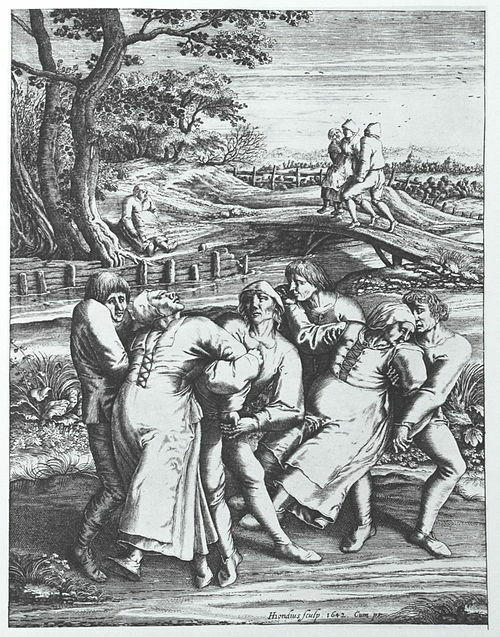 Ten other breakouts of compulsive dancing had occurred before 1518. 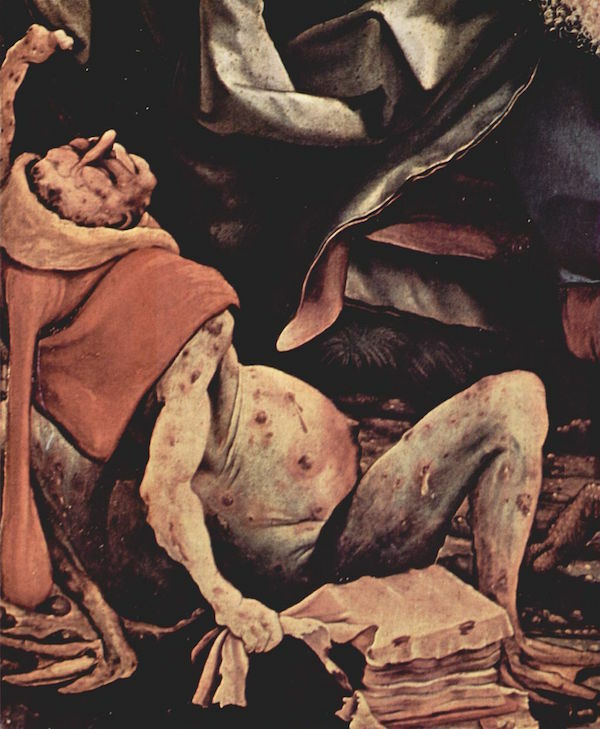 A massive outbreak happened in 1374, taking over entire towns in Belgium, Luxembourg and France. There was no cure for this frenzied dancing – prayers were the best, and perhaps only option. Ergot poisoning has been suggested as a cause for the dancing plagues of medieval Europe. Ergot, however, causes loss of motor control, not continuous coordinated movements. A historian named John Waller studied the phenomenon and concluded it was most likely mass psychogenic illness caused by intense stress. As cause of the stress, Waller cites the unrest of the times – harsh winters, famines and strong supernatural beliefs – including the belief that Saint Vitus, if angered, would send a dancing plague upon an unrepentant people. Medieval times were known for the nasty diseases that cropped up, including the King’s Evil, an infection of the lymph nodes, a form of tuberculosis. 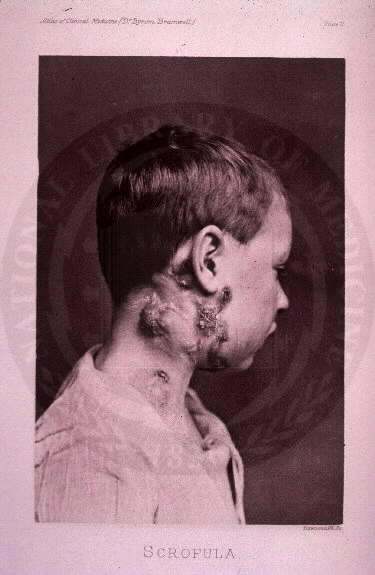 It resulted in painless, black lesions on the neck that could rupture into large open sores. Its cure was simple if unusual – a touch from the king or queen. Whether the touch of royalty ever actually cured the scrofula, as it was called, isn’t known, although it’s documented that France’s King Henry IV touched 1,500 sufferers. 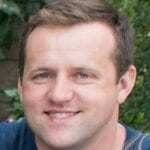 Perhaps some did find relief, as placebos can be powerful. Many kings and queens performed the touching ceremony – either by touching the necks of the ailing or by handing them a coin picturing an angel. During the Middle Ages, convents were often afflicted by mass motor hysteria, starting around 1400 and lasting about 300 years. While some or perhaps most nuns were devoutly religious, many others were placed in convents unwillingly. Many convents were poor and life was harsh with physical labor, a strict diet and unstinting prayers. Due to stress, many nuns would exhibit hysterical behaviours – from acting out sexually to signs of demonic possession such as foaming at the mouth, fainting and screaming to behaving as certain animals. In one French convent, a nun began to meow as if she were a cat. Soon many other nuns joined her in meowing; they all began mewling like cats at a particular time and kept it up for hours every day. People in the community heard the loud cat concert and were frightened. Finally the authorities sent soldiers, and the nuns were told they’d be whipped if they didn’t stop. For nearly 70 years, the Middle Age’s other plague ravaged England and parts of Europe. This disease was called the English sweat, as people with it could sweat themselves to death in a matter of hours. 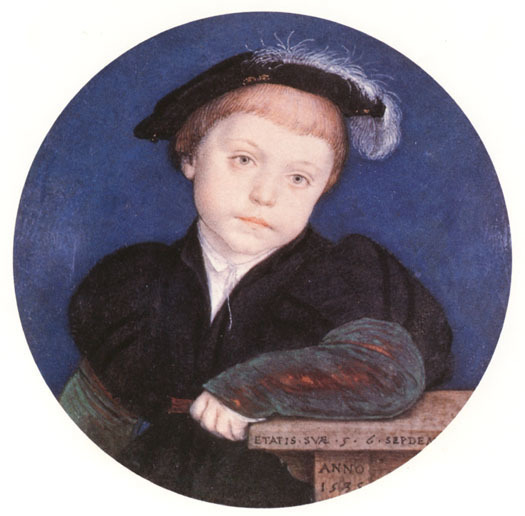 Beginning in 1485, the sweat afflicted England in the summers of 1508, 1517, 1528 and 1551 and then it vanished completely. Doctors of the time desperately tried to figure out what caused this strange affliction, but to no avail. The sweat began with feelings of apprehension, fever, extreme aches, stomach pain and vomiting. Profuse sweating followed extreme chills, then weakness, difficulty breathing, chest pain and finally death. Highly contagious, the disease mainly affected the English, only once escaping across the Channel to Germany where it immediately killed thousands. While not a huge killer like the Black Death, the English sweat still managed to kill hundreds of thousands during its reign of terror. There was no known cause and no cure, although a few people did survive, including Anne Boleyn. Today, doctors speculate it could have been a hantavirus, as the clinical manifestations resemble those of the English sweat.